The policies in this section apply to both graduate and undergraduate students. It is the responsibility of the student to be familiar with and to complete the requirements for the degree being sought. The staff of Pepperdine University will assist each student, but it is the student who must ensure that all degree requirements have been completed in the manner outlined in this catalog. Exceptions to academic policies stated in this catalog must be presented to the respective Program Committee and approved by the associate dean for each program. To process petitions, students should contact the Program Office personnel. Appeals of Program Committee decisions should be addressed in writing to the associate dean for the respective program. Students may add or drop courses through the second week of the trimester. The add/drop period for courses not meeting on a regular trimester schedule, such as seven-week courses or weekend mode courses, is adjusted in the same proportion as the class time is to the total class time for a regular trimester. Once classes have begun, students must receive faculty approval to add the class. Students must have all changes approved by the appropriate program personnel and must notify the office in writing. Refunds for courses that are dropped within the add/drop period will be calculated based on the date submitted via email, in person, or the postmark date on the envelope containing the student’s request to drop a course. Requests for course changes will not be accepted by telephone or in class. Students who withdraw from all classes as of the official first day of the trimester and up to the last day of the add/drop period for the trimester will be charged a $150 withdrawal fee. Attendance at every class and workshop is expected of each student. The class and course work schedules, including projects or presentation assignments, are made very early in the course of the trimester. In the event there is a conflict that will affect a student’s participation in class or a particular assignment or project at a scheduled time, the student is responsible for advising the professor and/or affected individuals in advance, and as soon as possible after the beginning of a trimester, to allow for alternative arrangements. Absence from classes or examinations for any reason does not relieve students from responsibility for any part of the course work required during the period of absence. Auditing a course may be an option for students, subject to the approval of the course instructor and space availability. A request to audit a course, accompanied by a detailed explanation, must be submitted in writing to the appropriate Program Office. Audited courses carry no unit value and are, therefore, not applicable toward meeting any degree requirements. Courses taken on an audit basis may not be retaken for credit at a later time. In rare circumstances, a student may request to audit a course which has already been completed for credit. Such requests must be approved by the Associate Dean for Academic Affairs. Students are responsible for a $100 administrative fee associated with each course to be audited. 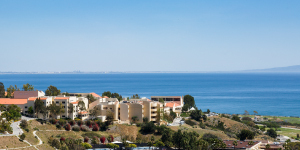 Academic credit at Pepperdine University is granted in terms of semester units. The total amount of class time in the trimester system is equivalent to the class time spent in a typical semester system. The above policy is applicable to all courses offered, regardless of the mode of delivery and/or session length (e.g. full term-length, weekend mode, abbreviated term, face-to-face, hybrid, online, etc.). Pepperdine University reserves the right to modify or discontinue any academic offerings or degree programs. In such cases, the University will make reasonable efforts to allow current students to complete the program or will assist in their transfer to other acceptable programs or institutions. Courses numbered 300-599 are open to students who have completed 40 units of work. Courses numbered 500-599 are open to upper-division or graduate students. These courses represent advanced upper-division work or graduate-level courses. Students taking 500-level courses for graduate credit will be required to do assignments in addition to those required of undergraduates. Courses numbered 600-699 are open to graduate students only. These courses may be taken for undergraduate credit in very rare circumstances and only with the approval of the associate dean. 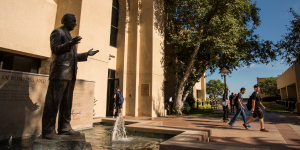 Students who are not admitted to an established Pepperdine joint degree program may still enroll for a limited number of courses in the University’s other four schools. Permission must be given by both the appropriate associate dean or designated administrator of the other school and the instructor of the course. Students should also have the permission of their academic advisor to ensure that the course taken will apply to their degree program. Students must complete the Cross-Registration Enrollment form and may enroll only if space is available in the course. For complete information regarding how tuition will be charged for students enrolled in cross-registered courses, please contact the Office of Student Accounts. The quality of achievement in a course is measured as follows. For undergraduates, “A” indicates outstanding achievement; “B,” superior; “C,” average or satisfactory; “D-,” the lowest passing grade; and “F,” failure. For graduate students, “A” indicates superior work, “B” indicates average or satisfactory, and “C-” is the lowest passing grade. A grade of “A” earns 4.0 grade points per unit; “A-,” 3.7 grade points; “B+,” 3.3 grade points; “B,” 3 grade points; “B-,” 2.7 grade points; “C+,” 2.3 grade points; “C,” 2.0 grade points; “C-,” 1.7 grade points; “D+,” 1.3 grade points; “D,” 1.0 grade point; “D-,” 0.7 grade point; and “F,” no grade points. A “W” or “WM” (withdrawal due to military service) indicates a withdrawal from a course in good standing. A “WF” (withdrew failing) is recorded in cases where withdrawal has been approved for a student not doing passing work in the course. It is calculated as an “F” in the grade point average. For certain specified courses, students receive the grade of “CR” (credit) in the event of acceptable work or “NC” (no credit) in the event of unacceptable work. In such courses where a grade of “CR” is given, no grade point value is assigned and the grade is not averaged into the cumulative grade point average. A grade of “CR” is assigned to indicate work equivalent to “A” or “B” and “NC” indicates “C” or lower. Credit/no credit grades are not computed in the overall or trimester grade point average, except where academic probation or academic dismissal is concerned. If there is a question of academic probation or academic dismissal, each “NC” will be computed as equivalent to zero grade points in figuring the student’s grade point average. In such cases, units for which a grade of “CR” was assigned will not be computed in the student’s grade point average. A grade of “I,” indicating incomplete work, is assigned to a student who has attended class but who, because of a documented emergency in the last quarter of the term, fails to complete the final examination or other assigned work. All such courses must be completed within one trimester from the date the grade of “I” is assigned or the “I” becomes an “F.” A time period of less than one trimester may be assigned at the instructor’s request. If a student cannot complete the work in the trimester (because of illness or other extenuating circumstances), the student may, with the instructor’s approval, file a petition for an extension with the Petitions Committee. This petition must be signed by the instructor and filed before the end of the trimester. A grade of “IP” (in progress) is assigned only in courses that are allowed more than one trimester for completion; e.g., student teaching, graduate theses, and graduate projects. “IP” grades assigned for the MSOD Applied Research Project will remain as “IP” until the research project is complete. If the project is not complete after 6 units of the MSOD Applied Research Project have been taken, then all “IP” grades will automatically default to “NC” (no credit). Enrollment verification will not be processed by the Office of Student Information and Services (Registrar’s Office) until a student is officially registered. Future enrollment will not be verified. To obtain enrollment verification, send a written request, or the appropriate enrollment verification form(s), to the Office of Student Information and Services on the Malibu campus. The request must include the specific trimester(s) of enrollment to be verified. Please do not mail verification requests prior to the first week of the semester. Additional information may be found at www.pepperdine.edu/registrar/verifications. For a BSM student, full-time enrollment is defined as 12 units per trimester, three-quarter enrollment as 9 to 11 units, and half-time status as 6 to 8 units. For graduate students, full-time enrollment is defined as 6 units for full-term enrollment or 4 units for enrollment within a six to nine-week session; half-time enrollment is 3 units for full-term enrollment or 2 units for enrollment within a six to nine-week session. This information is critical to students whose eligibility for federal, state, and institutional aid and loan deferment is based on their enrollment status. The Graziadio School provides a multi-level process by which students may dispute a grade assigned by a course instructor, in the event there are sufficient grounds for doing so. A grade appeal may pertain to either the final course grade or a specific assignment, project, or exam within a course. In either case, students have up to 30 calendar days from the date the grade was assigned to initiate the appeal process. To merit consideration, a grade appeal must meet one or more of the criteria below, as supported by documentation provided by the appellant. The grade was assigned in a manner that is inconsistent with the performance assessment method/standard specified in the course syllabus. There was substantial deviation - enough to impact the grade in question - between the course requirements articulated in the syllabus (or modified through advance communication by the instructor) and those to which the student was ultimately held. An error was made in the grade computation. A grade was assigned without relevant feedback or rationale from the instructor. As the initial level of appeal, a student is expected to directly engage the course instructor in an effort to resolve the grade dispute. From the date on which the appeal is initiated, the student and instructor have 14 calendar days to resolve the matter. Explanation of how the appeal meets one or more of the aforementioned criteria. Description and documentation of attempts to directly resolve the grade dispute with the course instructor (e.g., email exchanges, conversation summary, etc.). Other documentation or exhibits pertinent to the case (e.g., assignments/exams, grading information posted on Sakai, etc.). Any other materials, as requested by the Program Office or Department Chair. The petition and all pertinent materials are logged by the Program Office and routed to the Department Chair for review. Upon receipt of the formal petition, the Department Chair has 30 calendar days to review, investigate, and make a determination on the case. At the conclusion of the review process, the Department Chair will communicate the outcome to the student in writing. Explanation as to why the student believes the Level 2 Appeal was not handled thoroughly and/or impartially. Evidence to support the claim above. Any new information that may not have been available or considered in the original review. Unless dictated otherwise by extenuating circumstances, the final level review will be conducted by the Associate Dean of Academic Affairs. The Associate Dean will have an additional 30 days from the submission of the Level 3 appeal to render a decision on the case. Level 3 decisions are final and not eligible for further appeals. If a review at any level results in a modification of the final course grade, the official grade change process will be handled by the Program Office. It is the students’ responsibility to notify the Office of Student Information and Services immediately when they increase or decrease their unit load, withdraw, or take a leave of absence. It is also the students’ responsibility to inform this office every trimester of the number of units in which they are enrolled. All students using VA benefits must make satisfactory progress toward their educational objectives. In general, unsatisfactory progress is considered attainment of less than a “C” (2.0) grade point average for undergraduate students and less than a “B” (3.0) grade point average for graduate students for two consecutive trimesters. Students who withdraw from the University will have their benefits terminated as of the beginning of the trimester of withdrawal. If a student is dismissed for academic reasons, benefits will be terminated as of the date of dismissal. Students who have had their benefits terminated in this manner must be counseled by the school official before their benefits will be restored. Students who fail to complete all courses attempted in a trimester will have their benefits adjusted. Students who drop a course (or courses) in the middle of the trimester will have their benefits adjusted accordingly, effective as of the date of the drop or withdrawal. In cases where students do not return for the next trimester, benefits will be terminated on the ending date of the previous trimester. The Intent to Graduate form should be completed online and filed by the deadline dates indicated in the academic calendar. Students failing to file their Intent to Graduate form and pay their graduation fees (where applicable) by the deadline printed in the academic calendar for the trimester in which they plan to graduate will not be allowed to graduate in that trimester. Attendance at the graduation exercises is expected. The successful completion of programs at the Graziadio School requires individual behavioral and interpersonal competencies in addition to intelligence, motivation, and academic preparation. Such generally accepted behavioral criteria include, but are not limited to, interpersonal attributes and skills such as the ability to work with others, the ability to listen and communicate effectively, the ability to consider and use feedback, sensitivity to features of multicultural diversity and respect for others, and abilities in personal awareness and self-reflection. Students are expected to consistently display these behaviors and attitudes and to maintain a professional demeanor, both in and outside the classroom setting (both face-to-face and virtual). The appearance of interpersonal-emotional behaviors or attitudes that could significantly affect academic performance and professional competence may result in administrative review, recommended or mandated psychology consultation, and/or intervention, probation, suspension, or dismissal from the program. While every attempt may be made to remediate difficulties, serious unresolved problems could lead to termination from the program. Students who are involuntarily called to active military duty may withdraw from courses and the University at any time during the term. Transcripts will be coded as “WM” (withdrawal due to military service) for withdrawals that occur after the add/drop period. The student will receive a 100 percent tuition refund. No withdrawal fees will be charged. If the involuntary withdrawal occurs during the period of a term where the grade of “I,” indicating incomplete work, could be granted, students may request a grade of incomplete from the professor. All appropriate rules for incomplete courses apply, with one exception: If the student is still on active duty when the expiration date to complete the course and revoke the incomplete occurs, the grade will default to “WM” (rather than “F”) and a full refund will be made to the student. Furthermore, once students complete their involuntary tours of duty, upon request, Pepperdine will reactivate their status within the first 12 months following completion of their tours of duty without requiring them to reapply to the University. The students’ tours of duty time will not count as part of the time limit set for degree completion. Notification of military service. The student (or an appropriate officer of the armed forces or official of the Department of Defense) must give oral or written notice of such service to the school as far in advance as is reasonable under the circumstances. Notification of intent to return to school. The student must also give oral or written notice of their intent to return to the school within three years after the completion of the period of service. A student’s right to reactivate terminates in the case of a dishonorable or bad conduct discharge, general court-martial, federal or state prison sentence, or other reasons as described in 34 CFR 668.18(h) federal regulations. Please contact the VA School Certifying Official for additional information at (310) 506-7999 Office of Student Information and Services. The “MBA Plus” Alumni Lifelong Learning program is designed to provide Pepperdine MBA alumni an opportunity to update or extend the knowledge and skills acquired during their MBA studies by completing additional Fully Employed MBA courses. Pepperdine MBA alumni may choose to complete the set of courses associated with a Fully Employed MBA concentration: Applied Analytics; Digital Innovation and Information Systems; Entertainment, Media, and Sports Management; Entrepreneurship; Finance; General Management; Global Business; Leadership and Managing Organizational Change; and Marketing. The Dispute Resolution concentration is not available under the “MBA Plus” Alumni Lifelong Learning program. An official registration period is scheduled prior to the opening of each trimester and at the beginning of programs of study not on the regular trimester calendar. New students are expected to register in person. New BSM and MBA students may register via the Internet after attending an orientation session. After the first registration, students in the full-time programs, as well as BSM and MBA students, may register via the Internet, by mail, or in person. After the official registration period, a late registration fee may be charged. Students who do not complete registration properly or who fail to secure final approval from the Office of Student Accounts and the Office of Student Information and Services (Registrar’s Office) are not considered officially enrolled and will be denied all credit for the trimester. Exceptions to academic policies stated in this catalog must be reviewed by faculty and approved by the associate dean. Petitions must be made within one trimester of completion of the course work on which any petition focuses. All requirements for the degree must be completed within seven calendar years from the date on which the student begins work at Pepperdine University. Some degree programs have shorter time limits for completion; refer to the appropriate program section for specific requirements. In some cases, the associate dean may grant a limited extension of time. A written request, together with supporting evidence of extenuating circumstances, must be presented to obtain this extension of time. Transcripts are furnished upon payment of a fee for each transcript issued. Normally, official transcripts are delivered by mail. Official transcripts can be issued to the student only in a sealed envelope. If the seal is broken, the transcript ceases to be official. Current students may request official transcripts online through a service provided by the National Student Clearinghouse which is accessible through WaveNet. Ordering transcripts online provides students the convenience of 24-hour access and the ability to track orders electronically. Pepperdine alumni and students may request official transcripts by mail or in person. For more information, visit the transcript-ordering website at www.pepperdine.edu/registrar/transcripts. The request should show the student’s full name and ID number, the program of enrollment, and the inclusive dates of attendance. Transcript requests should be filed at the Office of Student Information and Services (Registrar’s Office) at least one day before the transcript is needed. Release of transcripts will be delayed during periods when grades are being processed at the end of each trimester. No transcript will be supplied for work taken at other institutions. Requests for partial transcripts will not be honored. The Office of Student Information and Services will not release transcripts unless the student has made satisfactory arrangements with the Office of Student Accounts. See the policy on withholding of transcripts, diplomas, and certificates in the “Financial Information ” section of this catalog. For full-trimester classes, a student may withdraw from any class without academic penalty from the beginning of the third week of a trimester through the end of the eighth week. The withdrawal period for courses not meeting on a regular trimester schedule, such as seven-week courses or weekend mode courses, is adjusted in the same proportion as the class time is to the total class time for a regular trimester. The permanent record will indicate a grade of “W” for such withdrawals. After the eighth week of a trimester, a student may not withdraw from any course without obtaining written permission from the Petitions Committee. No petition for special withdrawal will be considered during or after the final week of the trimester. Based upon the instructor’s indication of the student’s academic status at the time of withdrawal, a grade of “W” or “WF” will be assigned. Students who do not officially withdraw from their classes automatically will be assigned a grade of “F” by the instructor. No financial adjustment will be made for withdrawal after the eighth week of a trimester. Withdrawals are official only upon timely notification to the Office of Student Information and Services (Registrar’s Office) or the Program Office. Information on registration changes of any student receiving veterans’ benefits or government financial aid will be forwarded to the Veterans Administration and appropriate lending agencies whenever such changes occur. The Veterans Administration also is notified whenever a student receiving veterans’ benefits allows a grade of “I” to lapse into the grade of “F.” International students in F-1 visa status must obtain permission from the Office of International Student Services before withdrawing from classes if they cannot maintain full-time enrollment, consisting of at least 6 units for graduate students, 12 units for undergraduate students. A student who leaves the University during a term, but after the add/drop period, must officially withdraw from all classes as well as check out from appropriate campus offices. These offices are designated by the Office of Student Information and Services (Registrar’s Office) or the Program Office. Only those students who follow these procedures and return all appropriate documents to the Office of Student Information and Services are considered to be officially withdrawn. International students in F-1 visa status must obtain clearance from the Office of International Student Services before withdrawing from the University.